FredBear’s latest strategy game Knights and Glory is now available on mobile and challenges you to defeat the enemies’ caravan to rank up in the leaderboard. 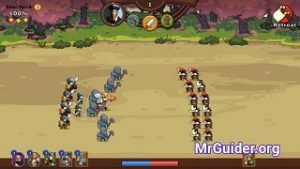 Knights and Glory game features a number of game modes; campaign mode, training camp, and the conquest. In all these game modes, you send the troops to defeat the enemies. The battle mechanics are also unique and the player needs to build the deck wisely. If you are having trouble winning the matches or in understanding the game’s mechanics, our Knights and Glory guide and Knights and Glory tips, cheats & strategies will help you. The core of the game is deck building and deploying the troops wisely on the basis of the enemy’s army. You will start the game from campaign mode and complete the chapters. As of now, the game features five chapters(head to the campaign mode screen -> tap the chapter to select). From this mode, you earn coins, character cards. In the training camp, you complete the stages and earn diamonds(premium in-game currency). And in the conquest mode, you will fight against other players’ army for the rank and the chests. To open these chests, you need keys. The game generates keys automatically as the time passes. From these chests, you can obtain cards, gold coins. In the battle, you can deploy a certain number of troops. You can check it at the top-left corner of the battle/defense preparation screen. To increase these numbers or send more troops in the battle, defense, you will have to increase the player level. How to level up? You need player EXP. And these EXP/Experience Points can be obtained by upgrading the cards, donating the cards to clanmates, and from the campaign mode. Head to the card menu -> tap the card -> there you can check the troop size. Depending on the troop’s size, it will count. Knights and Glory game features five types of units; Infantry, Archer, Cavalry, General, and Advisor. Infantry units are melee units and attack from a close-range. However, some infantry units can also attack from a long-range. Infantry units symbol – Sword. Archer type units in the game attack from a range. Their ranged attack is much powerful. Symbol – Bow. Calvary units deal 30% extra damage to the infantry. These units attack using a powerful weapon and from a close range; mount attack. Symbol – Horse. General type units lead the army from the front. With High HP stats and melee damage, these units work as a defender for back-end units. Symbol – Helmet. Advisor – Advisor type units use their skills and attack the enemy’s group over time. In the deck, you can add up to one unit from each type. And in the battle, it’s up to you how many units to deploy from each type. The battle system in Knights and Glory is quite unique. Before the battle starts, the player can check the enemy’s army; troop level, number of troops, and more. After it, you have to deploy the units; tap the + button. And at last, hit the fight button. At the top of the battle screen, you can check the turns. For example; it’s sword/infantry. Then infantry units will attack from both the sides. If the enemy has not included that type of unit, but you have included it, then your troops will attack. At the top-left of the battle screen, you can check the status; remaining troops. Win with a handsome number of troops(remain at the end of the battle) to get 3-stars. Mainly, there are three; gold, diamonds, and keys. You earn gold from the chest, campaign battle. Earn diamonds from the training camp mode. And to play the conquest mode, you need keys. You can wait until it generates automatically or watch the video ad to obtain. The player can spend diamonds in the special deals menu/shop to obtain premium chests; fire chest, lucky chest, and ultimate chest. So that’s all for now as Knights and Glory guide. Let’s take a look at our top Knights and Glory tips, cheats & strategy. The game lets you analyze the enemy’s army before you start the battle. Figure out the weak loops and deploy according to them. Infantry units deal 30% extra damage to the archers. Archer deal 30% extra damage to the cavalry units. And cavalry units deal 30% extra damage to the infantry units. In addition to it, you should also pay attention to the positions. For example; Infantry units lead from the front and then, in the back-end, cavalry/archers. And don’t forget to include the best units in the deck. Head to the cards menu and compare their stats. Upgrading the card increases the unit’s stats; health, attack. And you also earn EXP, required to increase the player level. As the player level increases, you will be able to deploy more units. You get duplicate cards from the chest, campaign missions. You get a free chest every certain amount of time at caravan post. It can store up to two chests at a time. So make sure to collect them asap. In the shop menu, you can purchase some cards in exchange for coins. New goods or deals available in the shop every day. So make sure to visit the shop menu often to grab the cheap deals. And don’t forget to claim the free chest. On the main screen, tap the clan headquarter and join an active clan. Once joined, tap the chat icon just above the cards option. This will open the chat menu -> head to the second tab; request. There you can request for cards. Donate cards to other members for EXP.